Eye On Tampa Bay: Is $260,000 to much money to finally solve the Pier Problem? Is $260,000 to much money to finally solve the Pier Problem? Thursday City Council will tussle with what to do with the Pier Selection Committee recommendation. There is a lot of posturing going on and private conversations with individual Council Members. Most of the talk centers around the desires of the public based on the City Survey, a couple of private poles and the recommendations of the Selection Committee whose actual process has come under some suspicion. Gradually emerging is the thought from City leaders and former elected officials that City Council should consider receiving and filing the recommendation from the Selection Committee and then disband the Committee. 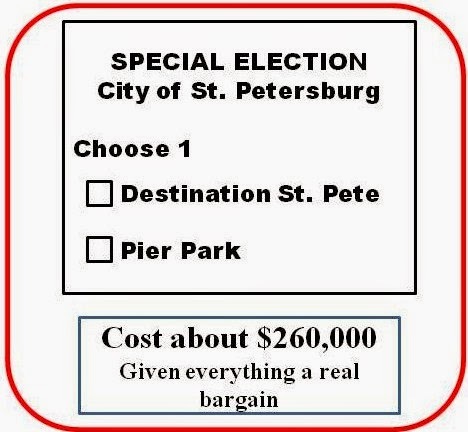 Council should then authorize a special election that would allow the public to vote on only the top two recommendations Destination St. Pete or Pier Park. The administration would be instructed in the ballot language to negotiate and build which ever design the public chooses. Simple, clean and accomplishes all the goals, public has an input, City gets the project started and finally the Pier gets moving. Mentioning special election always results in two camps. Those that don't want the special election because it is probably not going to go their way make a big deal about the cost. They bring up all of those endearing social programs, after school, summer jobs and on and on where that money could be better spent. In this case you can look for the Kriseman administration, which will be pretty sure this election is not going to go their way, cry poor mouth and indicate "they don't know where they can get the money." My first suggestion would be to reduce the staff in the Mayor's office. If this were some $260,000 pet project of the Administration, they would have the Budget Director, the Finance Director and their minions parading before Council indicating how budget neutral this idea really is. Laying around in all of those Budget buckets is plenty of unspent cash the administration has rat holed away. 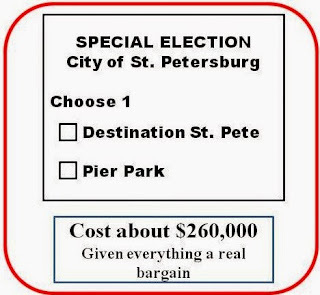 Council needs to instruct them to fund the special election for the Pier, and the money SHOULD NOT come from Pier tax proceeds, because the whole mess is due to the administration's poor leadership.